Looking for a fun matching game for kids? 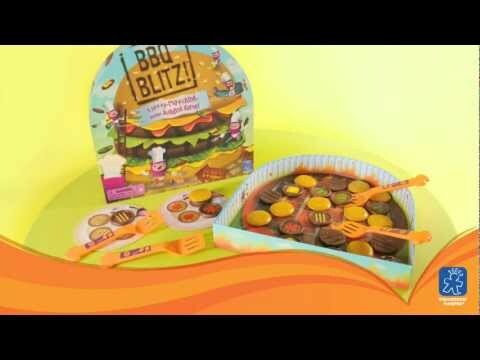 Some toys come along and are instant hits because of the versatility that allows kids of all ages to play – and that’s certainly the case with the BBQ Blitz! Though the game says it’s for kids that are ages 4 and older, my nephew who is a preschool kid, adores this game and can’t wait to play. The box is actually the game board and is cleverly created to look just a grill. Kids can see the individual pieces of charcoal below the grill and can see the flames, too. The burgers and buns are the game pieces that go on top of the grill. These pieces are placed down so that the printed side of them can’t be seen. Read what other parents say about BBQ BLITZ! on Amazon. Matching memory games have to take into consideration that a child’s concentration span is short – and that’s one of the things this one has done well. No child has to sit around waiting. Each of the players get to take their turn in unison as the kids scramble to turn over the burgers and buns to see which of the printed sides of the burgers they need to get. The object of the game is to match the burgers and eventually the buns to whatever printed plate the child has. Players start by finding the right meat patty that lines up with the condiment graphic on their plate. Once they do that, they have to get all four of the burgers for their plate before they can build on any of them. Once they have the burger, they move on to adding the top of the bun. check price on Amazon, is a fun matching game that takes skill and it’s not as easy as it looks to load the slippery burgers onto the spatula and get it onto the matching plate. This game utilizes a child’s memory function and helps improve their dexterity, motor skills and hand to eye coordination. Not only is the this one a fun and quick memory matching game for up to four players, but a lot of the younger kids love to play like they’re really grilling food. The pieces in this game are the 16 burgers with the graphics printed on them. There are a total of 4 different kinds of graphics on the burgers. Twelve buns come with the game as well as a spatula for each of the four players. Kids will play this game over and over because it’s a game that sparks imagination and is one of the best creative games for kids and games for preschool children that you can buy. As usual, have fun playing! P.S. Please join me on my next post about guessing games for kids.